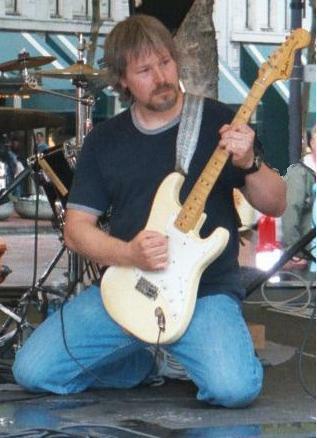 Kevin Ferguson is an Emmy Award winning musician/scientist/engineer/inventor with dozens of patents issued, dozens pending and 8 albums including best sellers on guitar9.com. He is currently the music director of Portland's Playback Theater improv group and also performs regularly in several world music groups (see debone.com). In addition to music, he has made significant contributions to DNA and protein sequencing technologies (for one the first PCR devices, many electrophoresis related devices), human perception simulation and prediction (vision, photosensitive epilepsy trigger prediction, aural and taste), audio and video compression assessment methodologies, display technology, digital to analog conversion reconstruction filtering, security systems and more. Whether subtle or extreme, Kevin Ferguson is a musical and intellectual adventurer. He is currently performing music culminated from decades of musical exploration including music normally not heard on acoustic or electric guitars: from the classical violin virtuoso to jazz sax to Balkan Gypsie to Bluegrass Banjo to Indian Rags to Native American "Ghost Dance Songs" to Turkish and Arabic belly dance music to music improvised to capture the essence of an audience member's story, along with the spectrum of music more native to his instrument, including flamenco, salsa, rock, jazz, etc. By twelve he had completed college music theory, played the violin, piano and guitar, created 35mm clay based animation films, won local art competitions, created a profitable news satire magazine, and created room-length Alexander Calder type contraptions. During his teen years he performed in local award winning bands, invented electric musical instruments including light to sound converters, an emoting head sculpture that vocalizes emotion from sights and sounds, completed (4.0) advanced theory and composition classes from then Julliard's Carmen Rodriguez-Peralta. He continued creating music (international guitar competition finalist, 8 multi-genre CD's, piano concerto, symphony, etc. ), art and technology eventually resulting in dozens of patents and several awards including an Emmy for video technology. Currently he develops mathematical models of human perception and other types of adaptation, designs high end professional video switcher video recording devices, writes, dances at many portlanddancing.com events (especially Balkan), performs on Turkish saz, guitar, violin, recorder and various hand percussion instruments in "Balkan & Beyond," "Ritim Egzotik," "Bellissimonde," and Portland's "Playback Theater" and creates in many media forms as evidenced at www.debone.com. In addition, he recently created a new web site, recipefactory.net, for creating more delicious, nutritious and afordable meals: An online application facilitates the creation of recipes conforming to over one hundred user controlled aesthetic and nutritional constraints. Although he has played many styles on many instruments on both coasts, but currently calls Portland, OR his home and guitar his main instrument. His performances have been heard in 5 continents due to airplay and purchases of his CD's since his 1995 debut, "Strad to Strat" which includes virtuoso classical violin showpieces transcribed for electric guitar. After local performances of this music for nearly 2 years (during which the CD stayed on Locals Only's top 24 selling list and since been on guitarnine.com's top selling list every year), In 2000, Kevin began performing music which is on his second CD, "Exotic Extremes": music from 5 continents transcribed for steel string acoustic and electric guitars along with his ensemble, "Teshkoto." "I made a goal of learning at least one tune I liked from every country in the world," he explains, "and though I may never reach this goal, it has brought me to some great music so far." He performs music from Asia (including Nothern Indian Classical Rags, Afghanistan, Pakistani, Chinese, Japanese and others), Africa, The Middle East, Europe (including Balkan and Baltic regions) and the Americas (including a Native American spirit dance song performed prior to the Wounded Knee slaughter). The CD concentrates primarily on the former Ottoman Empire: Macedonia, Bulgaria, Rumania/Serbia and the Middle East. This CD has also been on guitarnine.com's top selling list since it was introduced. Learning about other cultures has been quite rewarding for him as well. In studying Northern Indian Classical, he has taken lessons from Portland's Indian transplant Nisha Goshi, a student of a student of Ravi Shankar, for example. In addition, he performed percussion for Indian music with Shri Ravi Shankar (no relation) at Portland's "Old Church." Many of the areas ethnic communities have been quite open to sharing their music. He learned to dance many folk dances of the regions represented on the 2nd CD as well as other regions, played violin in a middle eastern orchestra and other world music groups in order to broaden his understanding and musicianship. These experiences, along with studying maqam, the Natya Shastra and other types of music theory, have lead to the development of a music theory that encompases all the above. 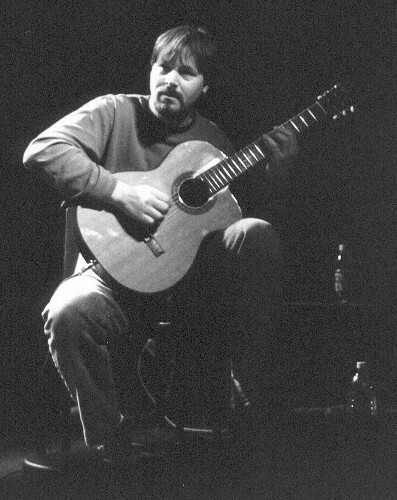 This in turn also lead to his original compositions showcased on his just released CD, "Subtle Hint," which includes such inventions as "Fugued Rachenitsa," a 7/16 based folk dance from Macedonia with Baroque counterpuntal ideas of Canon (including simple round, retrograde "crab" and inverted retrograde Canons) and Fugue, fractal melodies from misc. world melodic structures in "Liberation," 7+9+11/16 Balkan + classical + jazz + metal mix of "Mayday Macedonia," harmonic series meets ancient Indian meets rock guitar in "Kedar Tease", polyrhythm of 3/4, 4/4, and reverse Berenche (7+5/16 <-> 5+7/16) = African rhythm all over 12/16 with Todi scale harmonized with Western Classical minor in "So Much For Justice," world music structures mixed with insanely dense counterpoint erruptions in "Heated Discussions," along with a "Where's Waldo" sprinkling of more familiar melodic themes carefully hidden throughout. Then there's the more spontaneous "Dante's Nightmare," an impressionistic expression of a passage from his "Inferno," "Morrie's Pie" as an impressionistic expression of the rare mood of a death Morrie's style and so forth. This CD also includes classical and traditional world tunes as in the first 2 CD's. Kevin Ferguson learned to play violin at the age of 5, studied piano from 7 to 11, and picked up the guitar and started teaching himself at 11. He studied Music Theory and Composition first in a local community college in Virginia when he was 12 years old, and later in college with Carmen Rodrigez-Peralta of New York's Julliard School of Music. While in NY, he wrote and performed original jazz/rock tunes with "Trazee" and punk rock with "The Quaaludes." While on the east coast he played in theater orchestras, jazz, pop rock and even country bands. He has recently been further developing music theory, teaching local guitar students, doing studio session work for hire, creating more new original tunes, as well as developing his own new improvisational style and performing with his own band in his name. In addition, he is exploring the range of pure tones from the guitar and other instruments, including some of his own inventions, for the upcoming forth CD. In addition to musical inventions, Kevin also has 14 US Patents issued, 13 pending and 2 addtional recent applications for inventions in communications, video measurement and human perceptual response prediction. He is a co-recipient for a Technical Emmy Award as well (See his home page via the link below for more on this). "It's bloody amazing what I hear..."
"F(Censored)ING BRILLIANT!!!!!!! It's magic stuff. I love it..."
-- Douglas Johnston, "The Flying Scotsman," URY Radio, York, U.K.
"...the playing is impressive. Very impressive." "Mr. Ferguson is an intriguing and multi-talented genius. ...I am not surprised that 'Strad To Strat' belonged to the group of neoclassical bestsellers at Guitar9 Records." -- David MacLaine, Willamette Week. "I loved it. I was amazed at (Ferguson's) technique"
"Quite amazing and unique work." "...great, very interesting I must say, very talented as well." "Many people says that CD is fine." abilities blended well with beautiful melodies." For more on his current interests and activities see http://www.debone.com/kevinfhome.html.